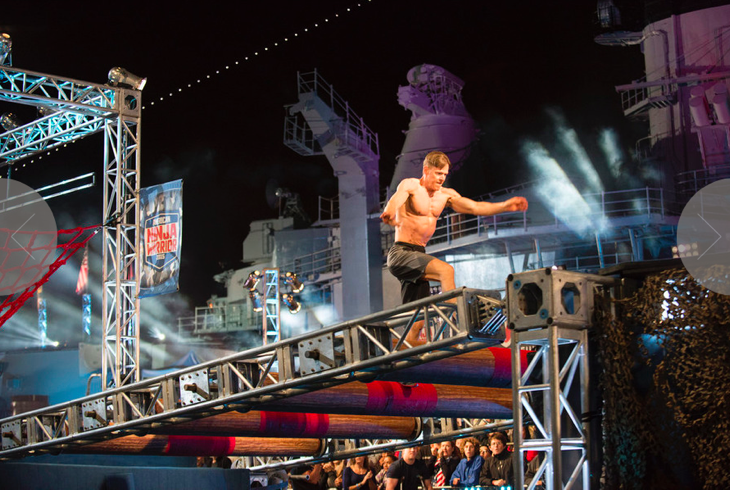 American Ninja Warrior, NBC’s obstacle course competition airs tonight with an all new Monday, August 17 season 7 episode 12 called “Military Finals.” We’ve got your recap down below! On tonight’s episode the top 30 competitors from the Military Qualifier tackle the Military Finals course. Obstacles include the Salmon Ladder, Arm Rings, Doorknob Arch and Spider Climb. On the last episode “American Ninja Warrior” traveled back to Pittsburgh, Pennsylvania where the top 30 competitors from the Pittsburgh Qualifier tackled the Pittsburgh Finals course. In addition to the obstacles from the Pittsburgh Qualifier, contestants will face Salmon Ladder, Floating Monkey Bars, Door Knob Arch and Invisible Ladder. Top competitors Elet Hall, Michael Bernardo, Joe Moravsky and Michelle Warnky took on the course. The Pittsburgh competitors will vied for a chance to compete in the Las Vegas finals, to win a cash prize of $1,000,000 and the title of “American Ninja Warrior.” Did you watch last week’s episode? If you missed it we have a full and detailed recap, right here for you. #AmericanNinjaWarrior is back with the Armed Forces tonight. The final 15 slots in the finals are up for grabs tonight. We are at the USS Iowa. There are 30 contenders tonight. Kristine shows us the course. There are the quintuple steps, the jump hang, log runner, monkey pegs, I-beam cross then the warped wall. The back of the course is the salmon ladder to the swinging frames, globe grasper and then the invisible ladder. First up is former Army member Preston Griffall, also a former Olympiad who was a luger. Last year he finished the qualifier but fell on the salmon ladder in last years regional finals. He hops the steps, then moves to the jump hang. He passes that and goes to the log runner to the monkey pegs. He goes for an early dismount and makes it. He moves to the I-beam cross. Now he takes the warped wall. He misses on the first run then makes it and moves to the salmon ladder and it takes him out again. Nathan Tucker is next and he moves quickly through the first three obstacles and hops off the monkey pegs. He’s on the I-beam now and moves to the end with a tumble but nailed it. Now he runs the warped wall and falls well short twice in a row. Sam Sann is there and tells him to wipe his shoes dry. He does and then makes it on the third try. Now he’s to the salmon ladder but he fell hard. Christopher Moore is next and he makes artificial limbs for amputees. He easily clears the first three obstacles then moves to the monkey pegs. He kills that too and then heads for the I-beam. He kills that then faces down the warped wall. He clears that and heads for the salmon ladder. He moves to the swinging frame and goes to transition to the second frame. He shakes his head and seems to know he can’t make it and goes into the drink. On the break, Alex Panyasiri fell on the I-beam cross and Omar Payton fell off the same vertical transition. Next is Ahmed Tour, a member of the US speed climbing team. He kills the steps then the hang and the log runner. He then does the monkey pegs rapidly and then takes on the I-beam. He scrambles along it efficiently, dismounts then runs the warped wall. He gets caught twice on the salmon ladder but recovers and also beats the swinging frames. Now it’s the new obstacle – the globe grasper. He makes it almost through and then he loses his grip and falls, but he should be good for Vegas. On the break, Benjamin Barrett cleared the wall but fell off the salmon ladder. Steve Martin bought it on the swinging frames but Jeremy Guarino was taken out by them. Next is Vincent Klapper, part of the Celtics dunk team. He clears the steps, the cargo net, the logs and then moves to the monkey pegs. He makes a huge early dismount then moves on to the I-beam. He gets hung up at the transition and takes a spill and he’s out of it. Over the break, Darren Virgo fell early on the jump hang, Deon Graham went out on the I-beam and Van Tran fell on the swinging frames. Now it’s Kyle Durand, a soldier who guarded Suddam Hussein. He easily hops the steps, traverses the hang and moves past the rolling logs. He’s takes the monkey pegs and moves to the I-beam where he fell at the same spot he did in the qualifier. Now it’s Jeremy Prather, a US Marshal and former Marine. He moves rapidly through the first three obstacles then on to the monkey pegs. He lost a moment there and spun around then waits and spins back then moves on. He clears it and moves to the I-beam. He kills that, moves past the wall, beats the salmon ladder and clears the swinging frames. He moves to the globe grasper. He makes it halfway and takes a tumble into the water – he may have a ticket to Vegas though! Fighter pilot Matthew Jensen is next on the course. He hops the steps, moves swiftly through the cargo hang and on to the rolling logs with no problem. Now it’s the monkey pegs and then he moves on to the I-beam. He moves along nicely and clears it then runs the warped wall easily. Now to the salmon ladder then he leaps to the swinging frames. He clears this as well and he’s the third of the night on to the globe grasper. He’s trying something different and is close to finishing. He makes it! He’s the first of the night to beat that obstacle but now it’s the brutal invisible ladder. He’s struggling from the get-go but as a gymnast, he’s used to rings. He keeps fighting and he falls at 20 feet but will definitely be going to Vegas as a rookie! He was so close to being the first finisher. Robin Pietschmann is on the course now and he’s on the monkey pegs. He takes on the I-beam next and he flips around on the transition then dismounts gracefully and runs the wall with aplomb. Now he moves to the salmon ladder and then onto the swinging frames. He’s moving fast and clears that too. Now it’s the globe graspers. Last year he went out on the 9th obstacle. He moves to the last section then loses his grip and takes an unexpected tumble. He’s a good shot for Vegas with that fast time. On the break, Jason Cantu couldn’t make it up the warped wall then Caleb Hayre fell short on the salmon ladder and splashed down. Justin Gielski is on the course now and he’s on the monkey pegs. He clears the pegs then moves to the I-beam and then up the warped wall. Now on to the salmon ladder then over to the swinging frames. He clears that and it’s on to the globe graspers, tonight’s Ninja killer. He’s struggling and falls on the first third but he had a good run and will move on to Vegas. There is still no finisher tonight but maybe the last two can do it. Dustin McKinney, the shortest competitor, is up now. He runs through the steps then to the cargo hang and the log roll. He moves to the monkey pegs. Now he’s on the I-beam and moving along. He made it up the warped wall and moves to the salmon ladder. He’s just going fast. He’s assured a slot in Vegas when he touched the frame and he swings and pounces on the second frame. He clears it. Now it’s the globe grasper. He’s moving along and is on the last third and clears it! He’s only the second to clear it tonight. Now he’s up to the invisible ladder – the #NavyNinja is ready to try it. He just goes aggressively and is going nuts. He slows but keeps fighting and makes it. He’s the first finisher of the night! Now it’s favorite to take it all – Ryan Stratis. He’s moving at a blistering pace past the steps and cargo hang then moves to the log rolls. He’s on to the monkey pegs and going hard. He clears that fast and moves to the I-beam then up the warped wall. Now it’s the salmon ladder. He has a misstep but recovers then moves to the swinging frames. He clears that but looks tired. Now he’s on the globe grasper. He’s moving fast and clears the first two parts and then he’s off of it and facing down the invisible ladder. He’s got 30 seconds to beat his time. He starts stomping a beat then gets on it. He’s stuck at 15 feet and struggling. He’s hanging and struggling but he’s out of fuel and drops.